Ever since Meghan Markle and Prince Harry went public with their royal romance in 2016, the former Suits star-turned-Duchess of Sussex has become a global style icon. Whether it was their Royal Wedding in May or her first public appearance following the official announcement that the couple was expecting their first child, the world is always waiting to see what ensemble Meghan, 37, will be stepping out in. Sometimes to see if it adheres to royal style protocol, but mostly so they can quickly find it and buy it for themselves. Given her skill at mixing high and low, as well as injecting menswear into some of her official outing looks, Meghan has had a major impact on the fashion industry, especially for the up-and-coming designers she chooses to put a spotlight on. Around the Royal Wedding, all of the major designers who contributed to Meghan's looks saw a massive increase in their search traffic, per Elle UK. Stella McCartney, responsible for Meghan's much-gushed-over reception gown, saw a 3,000 percent increase in searched for their dresses, while Givenchy, who designed the custom wedding dress, saw their search increase 61 percent. Of course, it's not just Meghan's wedding looks that have inspired frenzy online hunts; a crossbody bag she carried on several occasions sold out, leading to a 3,000 person wait list. Remember her white coat she wore for their official photos after announcing their engagement? It crashed Line the Label's site, with the label eventually renaming the now iconic coat "The Meghan." In fact, there's even a name for the impact Meghan is having on the fashion industry: "The Meghan Effect." According to economists at Brand Finance, the mom-to-be was expected to bring pump 150 million pounds ($210 million) into the British economy from her fans attempting to copy her style. "Her style is effortless and accessible," Christine OBrien-Ross, who runs Megan's Mirror, a site dedicated to chronicling the Duchess' looks, told Glamour. "I don't have a chance to wear Jenny Packham gowns [a favorite of Kate Middleton] and satin shoes, but I can wear Hunter boots from Nordstrom and ripped jeans." Basically, if Meghan wears it...it sells. "On average, if Meghan wears a designer, that brand will see a 200 percent increase in search demand over the following week," Yasmine Bachir, Lyst's (a global fashion search engine) senior communications executive, told Elle UK. And Meghan's impact is really felt when it comes to highlighting sustainable and eco-friendly fashion, proving you can be ethical and fashionable. 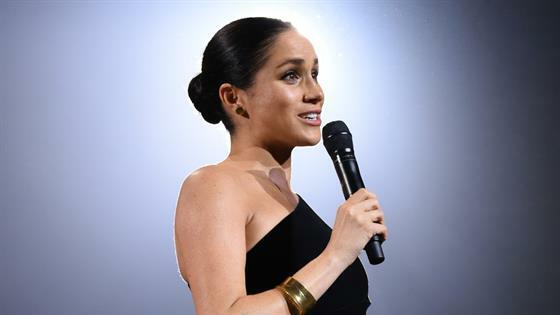 "It's an incredibly important topic in the industry that everyone must address, so it's great to see a prominent figure like Meghan championing this movement," Net-A-Porter's Global Buying Director Elizabeth Von Der Goltz told Elle UK. OK, so this ivory shift didn't actually break the Internet, but it did crash Australian designer Karen Gee's site after Meghan was photographed wearing her dress in public for the first time since announcing she was pregnant on Oct. 15. Aptly called the "Blessed" dress, you can have your very own custom-made for you for $1,285. "It's an absolute honor to have Meghan wear our dress," Gee told BAZAAR.com. "The fact that she could choose anyone in the world and she's chosen Karen Gee on her first day is phenomenal." People liked this Strathberry crossbody bag Meghan wore during a February outing in Edinburgh. They really liked it, as a spokesperson for the company told People that the item sold out in minutes, with the wait list growing to over 3,000 people. "The interest in the brand has been incredible," a Strathberry spokesperson said. "The phones began ringing constantly and our visitor numbers on our website were up by around 5000%!" Unfortunately, we have to be the bearer of bad news and report that it is still sold out. But Meghan has shone such a light on the small company that they are now selling their hand-crafted handbags in Nordstrom. Oh, and the gorgeous tartan coat she's rocking? It's by Burberry (of course) and it's sold out (of course). Meghan has had quite the impact on Burberry, with Poshmark noting an 80 percent growth in purchases of the brand's iconic trench coats solely because of the new royal. Meghan chose this navy blue Stella McCartney cape dress to be the first outfit she's worn to two public events, a very Kate Middleton move. She first sported it at a London concert in honor of the Queen's 92nd birthday in April, before breaking it out of her closet again in October to wear for the opening ceremony of the Invictus Games in Sydney, Australia. The light blue version is currently available in most sizes. For a church service celebrating Commonwealth Day in March, Meghan selected London designer Amanda Wakeley's gorgeous cream-colored coat, which promptly sold out. The good news? It is currently available in three colors in select sizes! As for her Mulberry bag, the brand saw a 95 percent increase in purchases on Poshmark after Meghan carried the satchel. Green is definitely one of Meghan's colors, as demonstrated by this all-green look she sported when the couple made an official visit to the University of Chichester's Engineering and Digital Technology Park in Sussex in early October. The best thing about the look though? Her silk blouse is available (and affordable!) at & Other Stories. But the real star of the look was the forest green leather pencil skirt by Hugo Boss, which is back in stock. Her Gabriela Hearst satin bag ($1,995) is still sold out. Ditto her stunning cashmere Emporio Armani coat. Fans of Meghan's style definitely took a liking to this dress—both for the design (That slit!) and the (somewhat) affordable price tag. The "Pineapple Dress" from Reformation retails for $218, and is finally back in stock in all sizes after it sold out when she wore it during a visit to Australia with Harry in October. The good news? Meghan's favorite sunglasses are pretty affordable, made by Illesteva. The bad news? They are out of stock, but only in some colors! During the couple's stop in Australia as part of their official 16-day Autumn tour, Meghan rocked a chic blazer from Serena Williams' clothing line, much to the tennis superstar's delight. "The face you make when you and Meghan have matching @serena blazers #BeSeenBeHeard," Serena wrote on Instagram. "Link in bio to shop the collection!" The blazer has since sold out, as have Meghan's suede ankle boots from J.Crew. However, her jeans, from Outland, are still available, and Meghan's impact on the brand has been major. The sustainable brand saw its online traffic increase 3,000 percent, and the company was eventually able to employ 30 new seamstresses in its Cambodian manufacturing operation, with the brand's communications director telling Elle UK, "Meghan's subtle yet steadfast adoption of our brand has had ramifications far beyond sales spikes and media attention." The Duchess of Sussex had some fun with color when she sported this printed wrap dress by Figue, featuring pom pom detailing and a ruffled hem, when she visited the University of the South Pacific in Suva, Fiji to watch a performance about the effects of climate change. The dress retailed for $1,495 but is currently out of stock. She paired the dress with a clutch made by local women, which was purchased at a market in Fiji. Meghan sported a green dress by Self-Portrait, which she topped with her trusty Alexander McQueen blazer. Unfortunately, the flattering $510 dress sold out pretty much everywhere after she was photographed in it. Meghan caused a frenzy when she sported J.Crew's navy and white wool coat while attending an International Women's Day parade in March. At $298, the classic style was an attainable get for many shoppers...and J.Crew had a massive restock in August, though the coat quickly sold out again. When it comes to affordable pieces, Club Monaco is a favorite of the Duchess', and she wore their Miguellina dress during a trip to South Melbourne Beach. Leave it to Meghan to still look effortlessly stylish even when the weather doesn't want to cooperate. She sported Muck waterproof rain boots for the couple's appearance at the ceremonial dedication of native bush land to the Commonwealth in New Zealand. British designer Roksanda Ilinčić's cute-yet-chic two-tone midi dress is still out of stock after Meghan chose it to wear at a youth empowerment event in October. Who new navy and periwinkle could look so good together?! When it comes to her footwear, Meghan definitely plays favorites, with Sarah Flint being at the top of her list. She's been spotted in the brand's heels, her sneakers and her flats on numerous occasions, and the Jay pump ($395) is a closet staple. During a stop in New Zealand during their tour in late October, Meghan topped her all-black ensemble with a Club Monaco trench coat, which is still sold out. Fortunately, her chic lace-up Stuart Weitzman Veruka boots are available, but the brand notes there is limited availability and they are not planning to restock. Oh, and they are available in four colors and are on sale—50 percent off, so you are basically getting them for free! Meghan looked ever-so-chic while attending Wimbledon in July with her sister-in-law, Kate Middleton, sporting a crisp Ralph Lauren outfit. Her striped oxford shirt is $590, while her silk wide-leg pants will set you back $1,690, bring the outfit's total to over $2,000. Meghan's all black outfit was topped off with this black and white pinstriped blazer by L'Agence, which is on sale but this close to being sold out again. Meghan loves a green skirt, and this Greta Constantine designed one fit her perfectly for a visit to Belfast in March. Her Mai coat, which has a waterfall collar and is a favorite of the Duchess', is available for $750, while her gorgeous Jimmy Choo velvet heels were from the brand's Cruise '18 collection...so not even available for us to drool over. And good luck trying to get the Charlotte Elizabeth handbag she was carrying, which is sold out in most colors. For their visit to the Nelson Mandela centenary exhibition at the Southbank Centre's Queen Elizabeth Hallin July, Meghan wore a chic sleeveless trench dress by Nonie. While you can still purchase the timeless dress in black, Meghan's sartorial impact was made clear on the designer's site in early December: "Please allow 4 - 6 weeks for production and delivery for black - BLUSH IS SOLD OUT UNTIL FURTHER NOTICE - please email info@houseofnonie.com to be placed on the waitlist." Fortunately, blush is back...but you'll have to wait for it, as it will be shipped in February 2019. Meghan is a big fan of a trench coat, which makes sense given its versatility. But she changed it up in October when she sported a plaid take on the closet classic by Karen Walker, which is, of course, sold out. But here's the good news: The black mini-dress she's rocking underneath it is still available and super-affordable, selling for $56 on ASOS. At the Women's Empowerment reception hosted by the Foreign Secretary during the Commonwealth Heads of Government Meeting in April, Meghan chose to wear a black sheath dress by Black Halo, which is as flattering as it is affordable. The Jackie O dress is available in four colors, and has been sported by everyone from Blake Lively to Kim Kardashian over the last decade. And the Gucci mini-bag she accessorized with saw a 214 percent increase in purchases on Poshmark following this outing. NBD! Meghan chose Veronica Beard's Cary dress in this bright blue for the couple's trip to Tonga (though she tweaked it a bit, doing away with thigh-high slits). It is back in stock in several sizes, and also comes in red. She paired the dress with simple heels from Banana Republic...that quickly flew off the shelves. If there's one thing Meghan loves it's a pinstripe dress, and this trench-style one from Altuzarra was one of her most popular looks of the year. The "Audrey" dress, which goes for $1,995, is currently still sold out, but the suede Tamara Mellon heels she wore are available for you to get your Carrie Bradshaw on in. Meghan topped the dress off with a chic Camilla and Marc blazer when she attended the Commonwealth Youth Forum in April. Meghan continued to show off her flare for maxi dresses when she wore a during a visit to Bondi Beach. The Martin Grant pleated dress is still available in a few sizes, though it will set you back $1,420. For one of her first official appearances after their May wedding, Meghan stunned in a yellow Brandon Maxwell dress at the Commonwealth Youth Challenge reception in London. The sheath dress, which is $598, is still sold out. And it's not exactly a surprise, as many are calling it Meghan's best look of the year. Maxwell is an American designer who has worked with Lady Gaga for years, as well as Oprah Winfrey and Tiffany Haddish. He is one of Project Runway's new judges and has become one of Meghan's go-to designers when she's looking for a dress for an official outing. Her stunning three diamond earrings are by Adina Reyter are available for $498, but due to high demand, might take a bit to get to you. So patience is a virtue when Meghan is your style icon. Almost a year later, Meghan's Alexander McQueen suit, tailored to perfection, is still sold out.